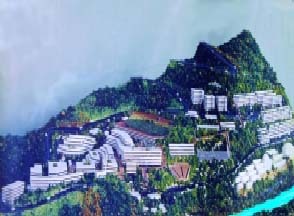 Development of a comprehensive physical master plan for the development of Beirut University College (Presently the Lebanese American University - LAU) new Byblos Campus. The proposed Campus covered a gross area of around10 hectares with an estimated ultimate population of 6,000 FTE (Full-Time-Equivalent) students. The study covered all facets of Campus development including educational, administrative, recreational and ancillary support facilities. It also provided for extensive student and academic staff accommodations, a President House, a multistoried car park topped by a football field, a heliport, deep wells and elevated water reservoirs, outdoor amphitheater and a sewage treatment plant. Inception, data collection and site investigatory studies. Development of a comprehensive space and facilities program based on the Client’s declared policies, goals and objectives. Formulation and evaluation of Land-use concept plan alter natives and nomination of a preferred scheme. Feasibility studies and analytical assessments. Phasing and programming of implementation in order to minimize interference and description to the normal daily operation of the campus. Development of overall landscaping theme and individual building architectural design briefs. The services included field investigations, topographic and geotechnical investigations, conceptual and detailed Master planning, preliminary design of roads and circulation network, infrastructure conceptual design, tendering and implementation guidelines as well as preparation of individual construction packages.